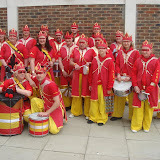 A summer fun day with Bloco Fogo providing the music at this popular school fete. A popular venue for the band with free burgers and hot dogs on offer. Was this with Richard at the helm?